Over two decades, the Happy Oasis has hosted hundreds of visitors with a shared vision of co-creating a healthier, happier, more creative and peaceful nature-loving humanity. 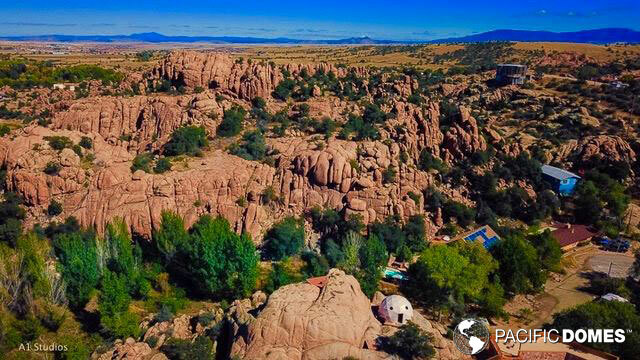 Located near Prescott, Arizona, the stunning red-ochre, almost-otherworldly landscape plays host to fun eco and spiritual retreats, featuring raw vegan food. One hundred miles of breath-making hiking trails wind through the wild natural preserve that surrounds the Happy Oasis. The lush paradise features secluded canyon pools with private beaches, friendly wildlife, fruit trees and organic vegetable gardens. Birdsong echoes around the property, which features a raised bed passive-solar green house, swimming pool and the majestic Golden Dome. Rain water is stored, grey water is recycled and hot water is solar heated. Ms. Happy Oasis, the land steward, shares her name with this idyllic place. 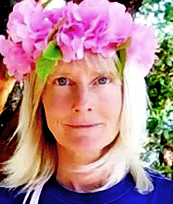 She is the author of Bliss Conscious Communication, the book that inspired Blissology University, and Uncivilized Ecstasies, ecstatic nomadic international adventure poetry about the joys of living beyond civilization. Her inspiring story was featured on Oprah. While enjoying an audacious, diverse life, Happy has served as an anthropologist, speaker, environmental advocate, eco-entrepreneur, inventor, architectural designer, poet, performer and health & happiness consultant. 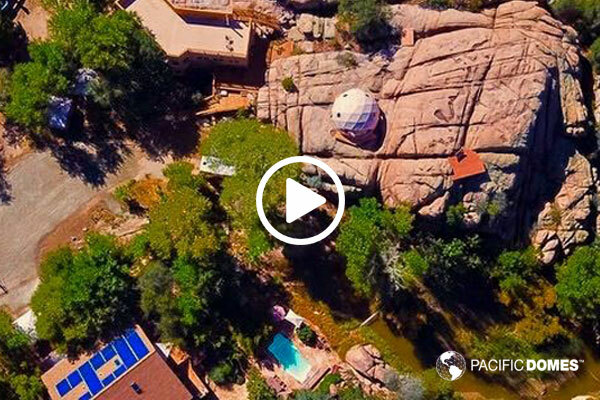 Pacific Domes recently spoke with Happy about the addition of a geodesic dome to the Happy Oasis. 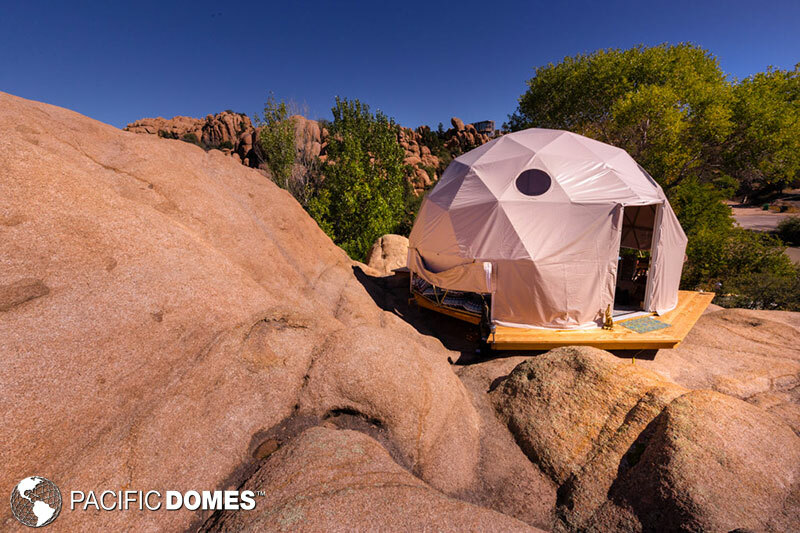 Pacific Domes (PD): Why did you purchase a dome for your property? Happy: We were seeking an aesthetically friendly architectural option that would best complement the rotund cliffs while blending with these beautiful boulders. The effect is surreal, thanks to Pacific Domes. Visitors frequently comment that they feel as if they have been transported to Mars or Jupiter. PD: How do you use your geodesic dome? Happy: Our dome has many names including the Spherical Miracle, the Golden Dome (the frame is metallic gold), and the Meditation, Contemplation, Music and Celebration Dome. Of course, we enjoy yoga and tea parties inside too. However, we prefer to use it as a sacred sanctum rather than for dining or sleeping. PD: What do you love about the dome? Happy: Even though it’s only 314 sq ft, the dome feels quite spacious due to the vertical walls and the huge arch window that reveals spectacular views of the canyon cliffs, forest, pool and pond below. In addition, the six round clear windows let in a generous amount of light. 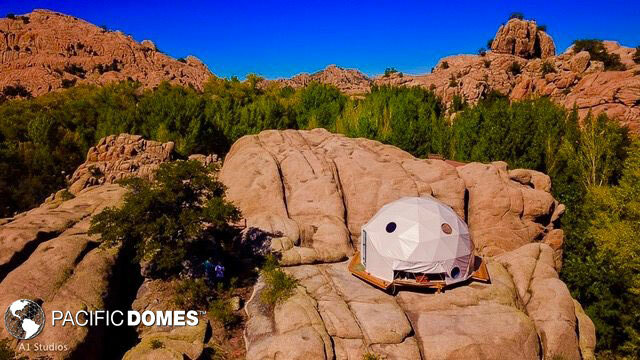 We’re glad to have ordered the dome in beige rather than white, because it blends into the surrounding tan boulder cliffs. Lastly, the audio amplification is uniquely compelling. PD: Does the dome feel different to a traditional dwelling? 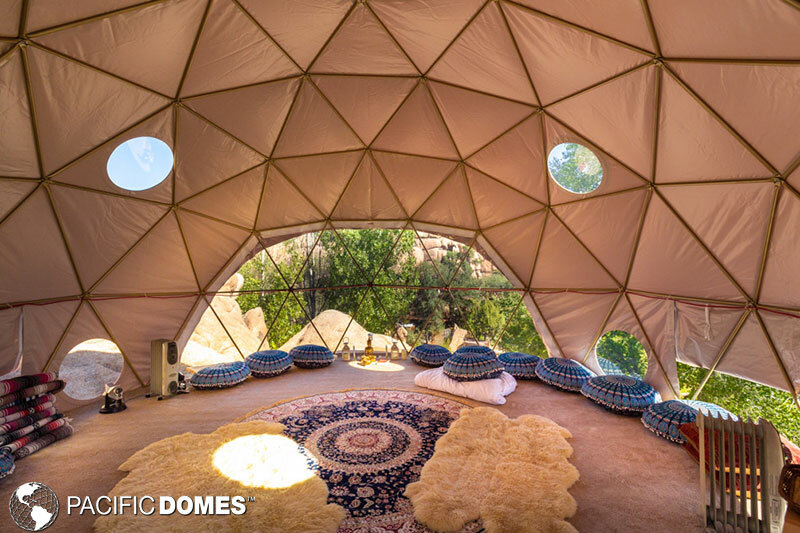 Happy: The dome beckons for community gatherings. We have already hosted concerts, cacao ceremonies, meditation celebrations, bliss conscious communication play-shops, yoga teacher trainings and breath work gatherings in these first three months. PD: How do you heat/cool your dome for comfort? Happy: We heat our dome with two adorable electric wood stoves and cool it by opening the side flaps and door. We’re also considering procuring the screen for the huge arch window to invite in the breeze on warm summer days. Happy Oasis footage and stills captured by A1 Studios. Previous Post:Make a Geodesic Gingerbread Dome for the Holidays!